In the new Hollywood film "Gravity" (in 3D), actor George Clooney tries to break the spacewalking record currently held by Russian cosmonaut Anatoly Solovyev. This is the second part in a series of conversations with the cosmonaut. Russia Beyond the Headlines: You were 13 when Yuri Gagarin became the first man to fly into space. Was it then that you decided to be a cosmonaut? Anatoly Solovyov (A.S.): No, not at all. It may seem paradoxical but after Gagarin was killed in a plane crash, I made up my mind that I should become a military pilot, like he was, and not a cosmonaut. I had no dreams of space when my childhood ambition did come true and I became a MiG-21 pilot. RBTH: You had accumulated a lot of skills and knowledge before you became a cosmonaut. Which skills helped you in your work in space? A.S.: I had to perform a lot of technical work both during spacewalks and at the station. It was a good thing that I had had experience of manual work. I was originally trained as a locksmith. So working with tools was not a revelation for me, which came in very handy. Mind you, we had to assemble whole units at the Mir station. For instance, a very complex air purification unit inside the core module was installed by me together with Pavel Vinogradov. Our American colleague David Wolf could not believe his eyes when the system came alive the moment we switched it on for the first time and never stopped working. RBTH: Are cosmonauts selected for a mission on the basis of their psychological compatibility? A.S.: No, there are far too many other, more important, parameters. To be honest with you, there were instances when relationships within a crew were extremely difficult. Although I personally always managed to find common ground with everybody and did not have a single incident in the five missions I went on. Besides, it is important to understand one thing, and any cosmonaut would tell you the same, that working in space, being in zero gravity creates a very aggressive environment and has a very negative effect on the whole body. Add to that lack of exercise, when all your muscles go slack, combined with a lot of physical and emotional strain. In effect, you work 24 hours a day. A weak person would not be able to cope with the pressure, or with the marathon of training that precedes a flight. In my case, my first space mission came 12 years after I first started training in 1976. RBTH: During your spacewalk assignments, did you have time to enjoy the beauty of the surrounding world, to contemplate the mysteries of creation? A.S.: There is of course very little time for distractions like these. When the station is in Earth's shadow or when the Mission Control give you time to take a break, then you get a moment to look around, to see the magical beauty of the planet gliding under your feet. It is a truly overwhelming sight! It's one's first spacewalk missions that are particularly memorable, when the psychological pressure is still there, as well as some quite natural anxieties, such as when you hold on to that railing slightly stronger than necessary. In a situation like that, it is in fact necessary to look around, to take a moment to marvel at the beauty around you, in order to get one's feelings under control. RBTH: Did you take any pictures? A.S.: Of course, we tried to take pictures of all that beauty. Some of them still survive. Although film does not last very well in space. It gets spoiled. So when digital technology arrived, it became possible to fully capture the magnificent views of Earth from space. 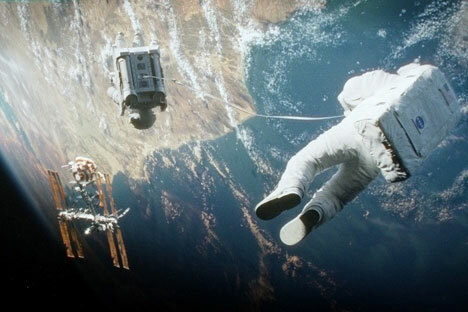 Which the makers of "Gravity" managed to do: to show what Earth looks like from the orbit. RBTH: Could you please tell us about a piece of work that needs to be done in space on a regular basis? A.S.: Well, once, in 1998, we, together with the Americans, were doing some work with the spectrometer, to measure the characteristics of the surface of the station in order to understand how its optical characteristics were changing. It is very important for spacecraft—which rays get reflected by it and which get absorbed, as all this affects the temperature control system inside the station. With time the exterior of the station changes considerably: there are cosmic rays, engines of spacecraft that approach and depart from the station, its own engines that are used for orientation purposes, then there is ordinary dust. View the infographic: Who wants to be a cosmonaut? A.S.: Yes, it exists. Moreover, it accumulates on the outside surface, including on the portholes. It settles in quite a thick layer. With time visibility gets seriously worse. Also, the "windows" get damaged by micrometeorites, so if you take a close look the glass from the outside is all covered in small dents. RBTH: Is it possible to clean the windows? A.S.: With what? Water? (smiling). When the dust settles evenly, what you get is a tinted glass, but if you try and scrub it away, the result would be only worse. One cosmonaut, who shall remain unnamed, once tried to clean the dust, as a result traces of his hands remained on the surface of the station for good. I had to lecture him a bit after that. RBTH: These days there is a lot of talk about space junk. What do cosmonauts do in real life when there is a danger of collision with space junk? A.S.: In my experience of space missions, i.e. in the 651 days that I spent in space, there were several incidents when a space object flew close to the station. By "close" I mean several dozen kilometers. In the event of a threat, we would get instructions from the Mission Control to take positions in the landing capsule. It was the best protected place on the station, and in the event of decompression, we could close the hatches and go down to Earth. But we never had to do that. Read the last part of interview with Anatoly Solovyev tomorrow!